Into the Woods with "Little Red Riding Hood"
Venture into the woods for an afternoon of song, dance and laughter. 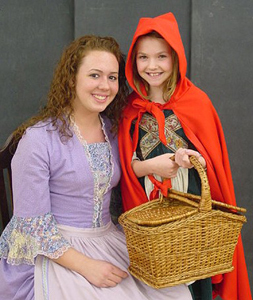 Join Kaleidoscope Theatre for a fun-filled musical adaptation of "Little Red Riding Hood" at Mercer County Community College's Kelsey Theatre on Saturday, March 21 at 2 and 4 p.m. Kelsey Theatre is located on the college's West Windsor campus, 1200 Old Trenton Road. With music and lyrics by David G. Payton and direction by Nicole Frechette, this unique retelling of the story welcomes audience participation. As the tale unfolds, several youngsters will have an opportunity to join Little Red Riding Hood on stage. The plot thickens as participants stroll with characters and meet a silly, ravenous old wolf who exclaims, "My 'tail' is a great tale to be told!" This professional touring production features Elizabeth Silvia as Little Red, Cassandra Pacheco as Mother/Granny, Ryan Hanley as the Big Bad Wolf and Mike Daniels as the Huntsman. the roles of the mother and grandmother. A Rhode Island based, award-winning theater company, Kaleidoscope Theatre has performed from Maine to Texas and was seen for three years on WPRI-TV, Channel 12, the ABC affiliate in Rhode Island. Well known for its unique versions of famous fairytales, Kaleidoscope Theatre also presents plays that help children cope with such issues as divorce, drug education, friendship, and developmental disabilities. The company has received numerous awards including a Rhode Island Theatre Achievement Award and a Rhode Island Jefferson Award. Tickets are $8 for children, students and senior citizens, and $10 for adults. Free parking is available next to the theater. Tickets may be purchased online or by calling the Kelsey Box Office at 609-570-3333. Kelsey Theatre is wheelchair accessible and provides assisted listening devices upon request. For a complete listing of adult and children's events for the 2008-09 season, visit the Kelsey website or call the box office for a brochure.